(Toronto, ON – January 19, 2015) – Indie Digital music discovery start-up, the A&R Report is gearing up to hit the airwaves! 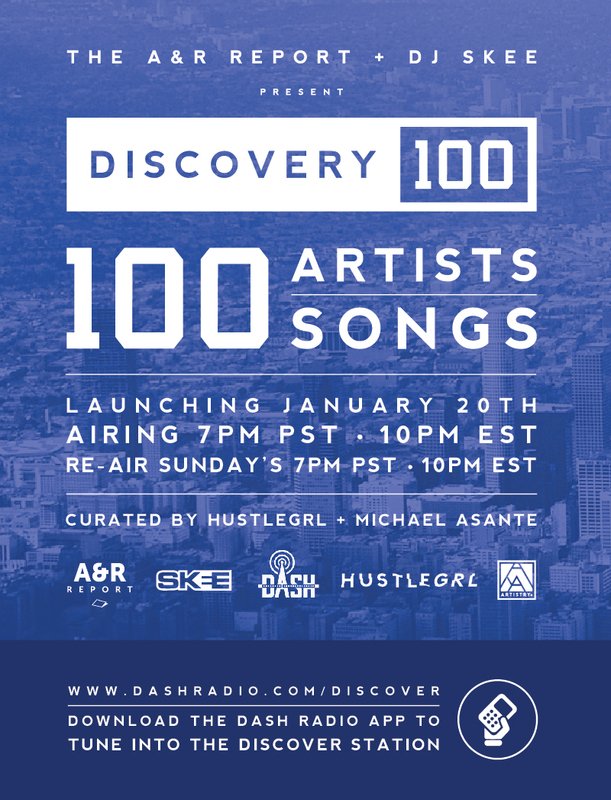 As part of a unique partnership with pioneering music influencer; DJ Skee; the A&R Report will carve out a lane in radio media for its new show Discovery 100 on the Discover Station of Dash Radio. The show will air for two hours weekly and feature songs from indie artists across the globe curated by Michael Asante (A&R Report) and Toronto tastemaker HustleGRL. Known for supporting artists primarily online, this move is key to the A&R Report’s expansion into other realms of media and helping more artists get featured on a wide reaching digital radio station backed by L.A. Reid, Matt Michelsen (co-founder of Backplane), and Mike Lazerow (former CEO of Buddy Media). The promo show will air on Tuesday January 20th at 7PM PST | 10 PM EST and re-air Sundays 7PM PST | 10 PM EST. Recognized as one of the most influential figures in today’s entertainment business by both Forbes & Billboard magazine, DJ SKEE is carving a new definition for what a DJ is. With a thriving career as an entertainer and multiple ventures under his umbrella, DJ SKEE is at the forefront of popular culture. DJ SKEE has generated over one billion media impressions in under a decade, and has a network of over 500,000 social network followers, SKEE can be heard daily on the radio, seen performing at the biggest events across the world, heard scoring movies & video games or remixing todays biggest artists, running a record label, production company, and marketing agency as well as owning a retail store chain. The A&R Report is today’s leading digital resource for information on indie artists and music industry news. A cutting edge music discovery start-up that not only focuses on new music but connecting budding artists with information on the industry’s key players which range from A&Rs to song-writers, engineers, DJs, publicists, marketing managers and more. To date the A&R Report has interviewed major players like Steve Rifkind, Teresa La Barbera Whites, Terrence Henderson, Lee Anderson, Mike Caren, Adam Barenfeld and more.